Roles Open: ALL ROLES OPEN! Suggested Audition Preparation: Read the play, which is available from Dramatists Play Service Inc. 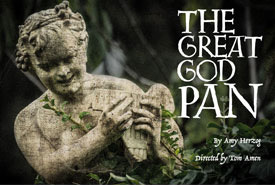 Haunting, insightful, and unfailingly honest, The Great God Pan is a compact, yet complex study of the ways in which seismic events often pass with barely a tremor on the surface of our lives. But what of the possible aftershocks? When a chance encounter between two childhood acquaintances uncovers a startlingsecret, a young man’s well-ordered world is suddenly rocked to its foundation! This production contains open roles for 3 Men and 4 Women. This is a very tight ensemble show; each dynamic character has their moment in the sun! Jamie (Late 20s) – A clean-cut, self-assured, and successful young man; an up-and- coming writer living with his girlfriend in Brooklyn. Frank (Late 20s) – An emotionally wounded young gay man; multiple piercings andtattoos. He’s had a rough life so far. Paige (Late 20s) – A former dancer, she is now working in the field of psychology. Less certain about her career than Jamie, she is also uncertain about their relationship. Cathy (50s) – Jamie’s Mother. She doesn’t pry, but Jamie is glad that she lives acomfortable distance away in the suburbs. Doug (50s) – Jamie’s Father. A well intentioned, but awkward man; he has a somewhat uneasy relationship with his son. Joelle (17-20) – A troubled, deeply insecure young woman with a serious eating disorder. Polly (80s) – The elderly former babysitter of Jamie and Frank. She suffers from dementia. She has a very warm heart. PLEASE NOTE: The director is also looking for highly committed crew-members who want to be a part of creating this beautiful little play. If you are interested in joining the production team as a part of the backstage crew, please attend the first audition on December 5th at 7:00 PM sharp, and we will sign you up!